On Mike Geokan's Bonneville Bullet we have a vacuum pump assembly run off the jackshaft to increase horsepower by keeping upper and lower end pressures negative instead of positive. We used the calculator to determine the diameter of the chain sprockets to check clearance issues when building the vacuum pump / jackshaft assembly pictured above. 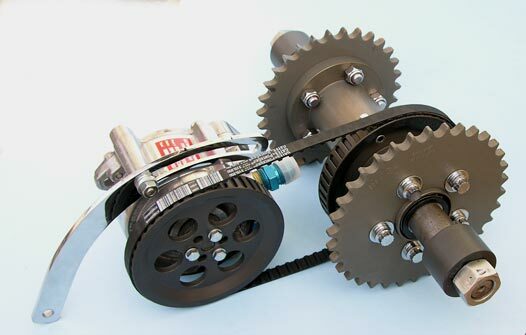 We also have a Chain Length Calculator which calculates the number of chain links required between two known sprockets. We use Sprocket Specialists for all our sprockets and have since we raced bikes at the Bol D'Or in 1977. They use 7075-T6 aircraft structural aluminum. We had Aerodynamic Plating anodize our sprockets and Jackshaft assembly but you can have Sprocket Specialists anodize yours. RB Racing goes to Bonneville and aluminum has to be anodized or it will instantly corrode. 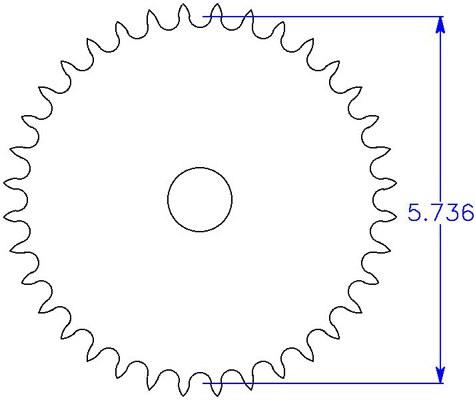 In the example above we have 36 teeth using a 428 chain with a pitch of .500" and a roller diameter of .3350" to calculate the sprockets diameter.